Ed Piatkowski - Go John Go !!! All profits for the first 1000 books sold will go to the American Lung Association. 50% will be donated for books sold after the first 1000. This is a remarkable story of a stage IV lung cancer survivor, who chose to fight his demons by hiking the Pacific Crest Trail, a 2,656 mile journey from Mexico to Canada making way through California, Oregon and Washington. This true story takes you on an exciting journey stirring fears and emotions mixed with the author's wisdom, humor and the reach for hope. 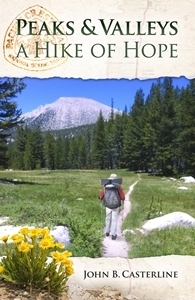 Peaks and Valleys A Hike of Hope is a must read for anyone affected by cancer. On July 31st, 2006, I retired for the 2nd time and one week later was diagnosed with stage 4 lung cancer. In Nov of 2010, I was diagnosed with prostate cancer and had my prostate removed. In Dec of 2010, I was diagnosed with throat cancer and surgery removed 95% of the tumor and radiation was used to complete the therapy. In 2011 thru 2016, I hiked 2310 miles of the Pacific Crest Trail (PCT). I plan on hiking again in 2017 and hope to complete the remaining 346 miles. For those not familiar with the PCT, it begins at the Mexican border near San Diego and ends at the Canadian border above Seattle. So, join me on this adventure. I am dedicating this trek to all those who preceded me in the battle to conquer lung cancer. Please make a contribution for the American Lung Association and support my hike. NOTE: John came to the American Lung Association in August of 2010 asking how we could work together to raise awareness around lung cancer and raise vital funds for research while incorporating his love of the great outdoors and backpacking. John's goal from the beginning was to raise $10 for every mile that he would hike along the Pacific Crest Trail...a grand total of 2656 miles. He has already exceeded this goal by raising over $28,737 which has been designated for the American Lung Association's Central Florida Lung Cancer Endowment Fund. These funds will be used strictly for lung cancer research in Central Florida. Please help us to further exceed this goal of by supporting this most worthy cause. If you would like, you can add your name, a short message, or a dedication of someone you are making this donation in honor of. M_t l_u ý dành cho ng__i ch_i cá c__c bóng _á _ó là h_n ch_ t_i _a hành __ng d_n t_t c_ s_ ti_n v_n mình có vào cho m_t tr_n __u. It's a pity you don't have a donate button! I'd definitely donate to this excellent blog! I guess for now i'll settle for bookmarking and adding your RSS feed to my Google account. I look forward to new updates and will talk about this blog with my Facebook group. Talk soon! Simply had to emphasize Now i'm grateful that i happened onto your web site. For further information call us on 0800 058 2517 or please email us at wholesale@scottsvapourco.co.uk. Second, congratulate them on their properly-thought out comment. Tell them they raise good points and clearly have one thing to say. Nh_ng dòng ch_ nét ch_ c_a b_n luôn li_n m_ch, nh_ng nét g_ch ngang x_u xí s_ không còn xu_t hi_n n_a. V_y thì _ây là bài vi_t dành cho b_n! Unbelievably individual pleasant site. Astounding info offered on few gos to. Hi there, very good online site you've gotten at this time there. Great looking website. Think you did a lot of your own html coding. Hi! I was speculating whether anybody might assist me to locate the guide for Yoggys Money Vault Trust Pilot Scraper ( %url ) Money Vault Email Parsel? I have actually purchased the software but I did not get an end user guidebook with it. Many thanks! Some genuinely nice stuff on this website, I it. Just want to say your article is as astounding. The clarity in your post is simply spectacular and i could assume you are an expert on this subject. Fine with your permission let me to grab your RSS feed to keep up to date with forthcoming post. Thanks a million and please keep up the rewarding work. Thanks a ton! It is definitely an very good site! Great Webpage, Preserve the excellent job. thnx. Thanks extremely useful. Will certainly share site with my good friends. B_n không c_n nh_n F5 __ t_i l_i trang, v_i tính n_ng v__t tr_i này s_ giúp cho khán gi_ thu_n ti_n h_n khi ch_n kèo. Just simply wanted to point out Now i'm relieved I happened in your web site! Theo _ó, three __i có v_ trí th_p nh_t trên b_ng x_p h_ng vào cu_i mùa t_i La Liga s_ ph_i xu_ng ch_i _ La Liga 2 mùa ti_p theo. Keep up the great job and bringing in the crowd!